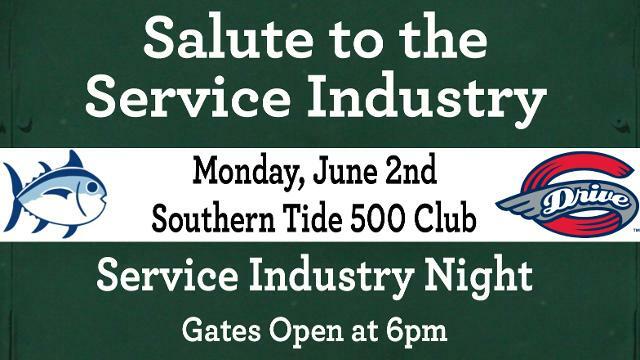 The Greenville Drive are excited to salute members of the service industry with Service Industries Night at Fluor Field for Monday night’s game against the Lexington Legends. The game begins at 7:05. Members of the service industry with proof of employment will receive $6 tickets for the game along drink specials all night long, including $2 domestic drafts, $3 Yukon Jack and $4 Jager! Don’t miss out as the Drive celebrate the service industry! To purchase tickets for Monday’s game, stop by the Main Street Box Office, call (864) 240-4528 or log onto GreenvilleDrive.com. This article originally appeared on the official website of the Greenville Drive. Click here to view the original story. The Lynchburg Hillcats and Virginia529 College Savings Plan have teamed up to reward high academic achieving students in the local area. 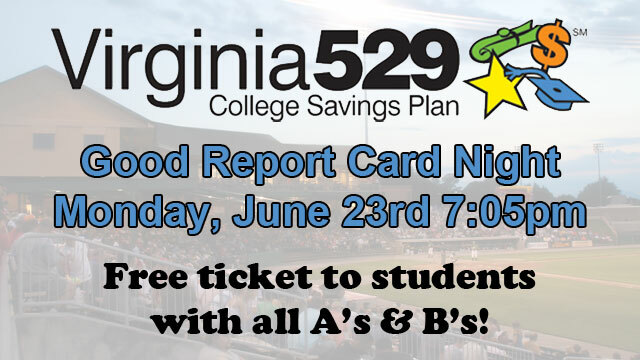 All elementary, middle school, and high school students with a report card with all A’s and B’s, can come to the Lynchburg Hillcats Box Office to earn a free GA ticket for the game on Monday, June 23 at 7:05. (Ticket may only be used for the student). Simply fill out this form and bring it along with your report card to the Hillcats Box Office prior to the event anytime Monday-Friday 9am-5pm, or the day of the game to earn your free ticket. Good Report Card students may also participate in a parade on the field before the game! To participate, register at the Virginia529 table on the concourse between 6-6:30pm. The parade will begin at 6:35pm. Virginia529 College Savings Plan is the Official College Savings Plan of the Lynchburg Hillcats. Virginia529 offers four flexible, affordable and tax advantaged programs to help you save in advance for higher education. Visit www.Virginia529.com to learn how you can tame the Tuition Monster. This article originally appeared on the official website of the Lynchburg Hillcats. Click here to view the original story. 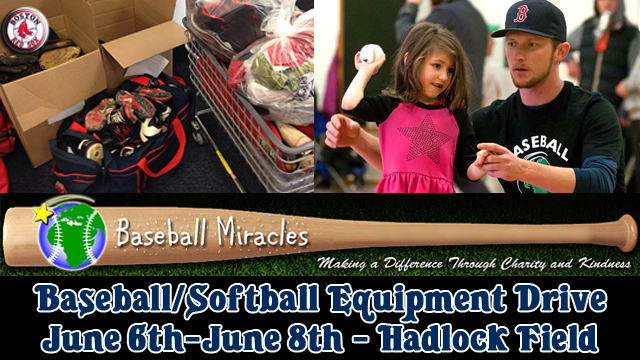 The Portland Sea Dogs, in conjunction with Baseball Miracles, are pleased to announce a Baseball/Softball Equipment Drive at Hadlock Field from June 6th – 8th when the Sea Dogs host the Bowie Baysox. Fans are encouraged to bring new or old baseball equipment to the ballpark to be donated to children who are faced with economical or environmental disadvantages. The Sea Dogs will accept all types of baseball and softball equipment including gloves, bats, catcher’s gear, bases, baseballs, softballs, wiffle balls and bats, which will be all donated to Baseball Miracles. A non-profit organization, Baseball Miracles is a team of baseball and softball instructors, founded by Hall of Fame scout John Tumminia, who have joined together to teach boys and girls with economic and environmental disadvantages throughout the world. Sea Dogs’ pitcher Mike McCarthy is the driving force behind bringing this initiative to Hadlock Field. The Portland Sea Dogs return home on Tuesday, June 3rd and open up a six game homestand through Sunday, June 8th. The equipment drive will begin before the Sea Dogs game against the Bowie Baysox (Orioles affiliate) Friday at 7 p.m. and will run until the end of the game Sunday. Any equipment fans bring for the drive should be brought into the ballpark and dropped off at the Baseball Miracles box at Guest Services in the concourse at Hadlock Field. For more information on the drive, please visit www.seadogs.com or www.baseballmiracles.org. This article originally appeared on the official website of the Portland Sea Dogs. Click here to view the original story. The sixth annual “Heading For The Big Leagues” entrepreneur expo returns to Dow Diamond on Thursday, May 29. Sponsored by the Mid-Michigan Innovation Center, the event brings together a wide variety of groups – from regional innovators and startups, to community and business leaders. The event kicks off at 3 p.m. with a MiQuest Coaching Session and a Buyer’s Circle Panel Discussion. There will be two sessions available for both events – from 3-4 p.m. and from 4-5 p.m. Also from 3 to 5 p.m. is an Advanced Materials Tech Forum, which is by invite only. The VIP Reception and MMIC Award Presentation will be from 5 to 6 p.m., and hors d’ouevres and beverages will be available. This article originally appeared on the official website of the Great Lakes Loons. Click here to view the original story. Did you know roughly one fourth of our local population relies on some form of food assistance? 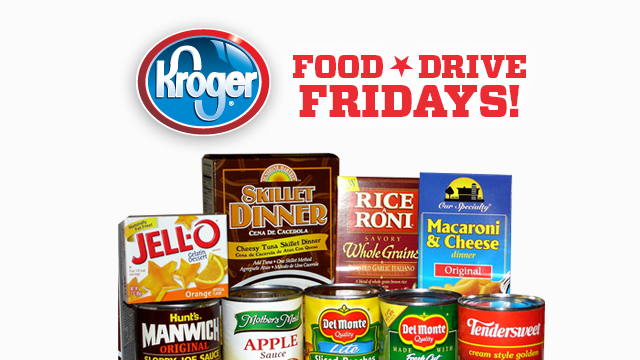 To help address the needs of our community, the Toledo Mud Hens and Kroger have teamed up on the Kroger Food Drive Friday program. Donate generously! Fans are encouraged to bring non-perishable food items to the ballpark that night. Collection bins will be located at all Fifth Third Field entrances, and anyone bringing a minimum of three items will receive a reusable shopping bag, courtesy of Kroger. Food Drive Friday events will be held on June 13, July 11 and August 15. This article originally appeared on the official website of the Toledo Mud Hens. Click here to view the original story. Following the overwhelming support from the Muhlenberg Township community to raise funds for the Derrick Redcay Strong fund on Saturday, May 3rd’s game, the Reading Fightin Phils will be hosting Redcay Strong Community Day at FirstEnergy Stadium on Saturday, June 14th from 11:00 a.m. to 4:00 p.m. thanks to Savage 61, Forino, and Lowe’s. Admission to the event is free for all ages. A $10 wristband for unlimited access to children’s activities during the afternoon will also be available at the event. As part of the day’s festivities, Savage 61 will be donating a brand new 2014 Dodge Dart to be raffled off at $10/ticket. All money earned through the raffle will go to the Redcay Strong fund. Savage 61 will also be coordinating a handicap accessible van for Derrick and his family. Lowe’s will also be donating supplies to the Redcay family in order for them make the family garage accessible for Derrick. The event benefits the Derrick Redcay Strong fund, which has been set up to assist with the ongoing expenses related to the support and care of Derrick and his family. Local fire companies, ambulance, police department, township, and school officials have joined forces with his church Alsace Lutheran in the fundraising efforts. On April 24, 18 year-old Muhlenberg High School senior Redcay suffered a rare stroke to his spinal cord that severed his nerves at the C4-C6 area. As a result, Redcay no longer has sensations and movement below his neck and needs assistance with breathing, which his family hopes is temporary. Derrick is a member of the high school varsity baseball team, the Alsace Lutheran Church Youth Group, and is a member of the National Technical Honor Society, earned by maintaining a 3.5 GPA since the 9th grade. Derrick is also a volunteer firefighter with the Goodwill Fire Company, helping out at a 5-alarm blaze in the township less than 24 hours before he was stricken. Derrick has been accepted to the University of New Haven to study Fire Science. Volunteers from the Redcay Strong fund will be on hand June 14th to sell Redcay Strong t-shirts, bracelets, and decals with the proceeds going to the fund. Fightin Phils concession stands will be open during the event from 12:00 p.m. to 4:00 p.m.
For more information regarding the Redcay Strong fund and how you can donate, visit RedcayStrong.org. This article originally appeared on the official website of the Reading Fightin Phils. Click here to view the original story. 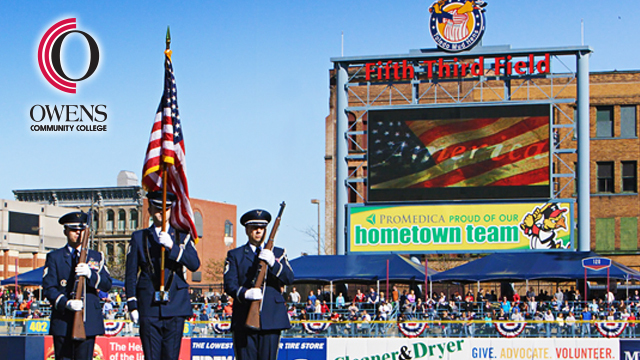 Freedom isn’t free, and the Toledo Mud Hens are teaming up with Owens Community College to remember the sacrifices made by current and former military and public safety personnel during Veterans Appreciation Night at Fifth Third Field, on Saturday, June 14. That evening a special pregame ceremony will be held to honor our veterans, as well as many tributes to our troops throughout the game. The Mud Hens will take on the Buffalo Bisons on June 14 at 7 p.m., with gates opening at 5:30 p.m. For tickets, call 419-725-4367 or order online. All the info on the Veterans Appreciation Night festivities can be found at www.mudhens.com/veterans. Every ride of the opening season for the new Ferris wheel at Modern Woodmen Park will help benefit the Genesis Health Services Foundation, the Quad Cities River Bandits and Main Street Amusements announced on Friday. For each ride, 50 cents will be donated to the Genesis Health Services Foundation, benefiting Camp Genesis, Genesis Neonatal Intensive Care Unit and Genesis Flu-Free Quad Cities. The River Bandits also announced a new Fast Lane to board the Ferris wheel for IHMVCU members who purchase tickets for the ride and show their membership at the Ferris wheel queue. Sundays, 2 p.m. to 6 p.m. 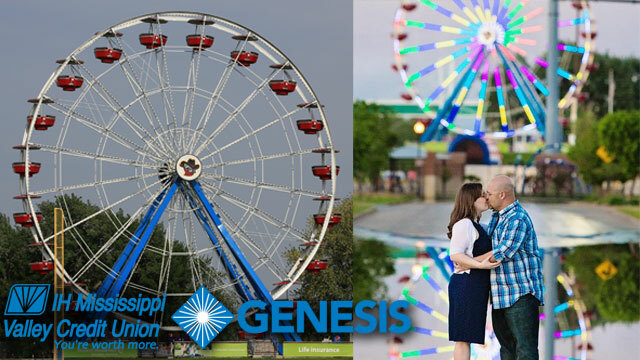 This weekend’s special Memorial Day hours will be noon to 6 p.m. on both Sunday, May 25, and Memorial Day Monday, May 26, to celebrate the opening of the first Ferris wheel inside of a minor league ballpark. To ride the Ferris wheel and enjoy the other amusements at Modern Woodmen Park, fans may purchase special tickets that can be redeemed at amusement areas, including the Ferris wheel and Bounce QC Kids Zone. Tickets are sold at $1 each, 5 for $5, 12 for $10, and 20 for $15. One Ferris wheel ride is 5 tickets. No tickets are required for children three years and under, but children shorter than 42 inches must be accompanied by an adult on the Ferris wheel. The Ferris wheel has 20 gondolas, with each able to hold a maximum of six adults or up to eight people including children. The loading process requires weight balance throughout the Ferris wheel. Once loaded, a full ride is approximately three to four minutes. The wheel moves at approximately 7.5 miles per hour. The River Bandits and Main Street Amusements are offering an all-you-can-ride-and-bounce daily pass for $20, and a season pass for unlimited rides and play in the Bounce QC Kids Zone for $49. Purchases can be made at the amusement areas of Modern Woodmen Park. 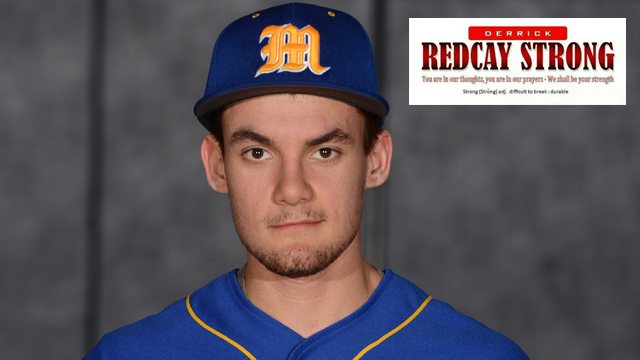 This article originally appeared on the official website of the Quad Cities River Bandits. Click here to view the original story. 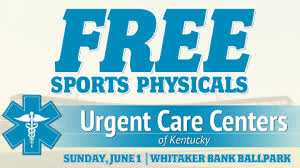 Urgent Care Centers of Kentucky will team up with the Lexington Legends to offer free sports physical examinations at the Legends game Sunday, June 1 at Whitaker Bank Ballpark. Gates will open at 5 p.m. June 1. The free examinations will begin at that time and will be available until 8 p.m. The game between the Legends and the Augusta GreenJackets will begin at 6:05 p.m. The sports physicals will be conducted by the certified medical staff of Urgent Care Centers of Kentucky. No payment of any form, including copays, will be charged. Parents will need to bring their identification or state driver’s license and should be prepared to fill out forms and provide medical history. For more information, contact Bosso at 859-422-7855 or sbosso@lexingtonlegends.com. This article originally appeared on the official website of the Lexington Legends. Click here to view the original story. Great Day Farms, along with the Northwest Arkansas Naturals players and coaches are once again teaming up for the seventh annual Youth Baseball Clinic at Arvest Ballpark, to be held from 2 until 4 P.M. on Saturday, June 21st prior to that night’s 6:05 P.M. game against the Tulsa Drillers, the Double-A Colorado Rockies. The FREE Youth Baseball Clinic is open to children ages 6-12 and will cover instruction of key baseball fundamentals, including hitting, fielding, pitching, and base running. All participants will be given a complimentary Jack Link’s Beef Jerky Grass Berm ticket to that evening’s game against the Drillers, and the first 300 children to arrive for the clinic will also receive a FREE t-shirt courtesy of Great Day Farms. Instruction during the clinic will be given by select Naturals players and coaches. Following the instruction portion of the clinic, an autograph session will occur along the 1st base side of the concourse for approximately 20 minutes. There is a sign-up form located on the Naturals website, nwanaturals.com, under the community menu that interested parents can print, fill out, and then fax or mail in to register their children for the clinic. The FREE Youth Baseball Clinic is also open to local youth coaches as they may also fill out the form and fax in their roster to register their entire teams. The deadline to register for the event is Wednesday, June 18th, but participants are encouraged to sign up quickly, as previous events have filled to capacity prior to the deadline. Sign-up begins at Arvest Ballpark at 1:30pm so we ask that you arrive early as participation is limited to the first 500 children. In addition to the kid’s clinic, fans are invited to bring canned food items to the ballpark at their own request that will be donated to the Samaritan House; however, a food donation is not mandatory for participation. The ballpark will be cleared following the FREE Youth Baseball Clinic and then gates will reopen at 5:00 P.M. for the Naturals game against the Tulsa Drillers scheduled to begin at 6:05 P.M. that evening. If you have any questions regarding the clinic or game, please call (479) 927-4900 or visit our website for more information. Tickets are still available for the Naturals game on Saturday, June 21st. Fans may purchase tickets online at nwanaturals.com, via our toll-free ticket hotline at (877) 444-2637, or by visiting the Arvest Ballpark Box Office. Proceeds from Friday’s release of Homefront IPA will benefit Operation Homefront. 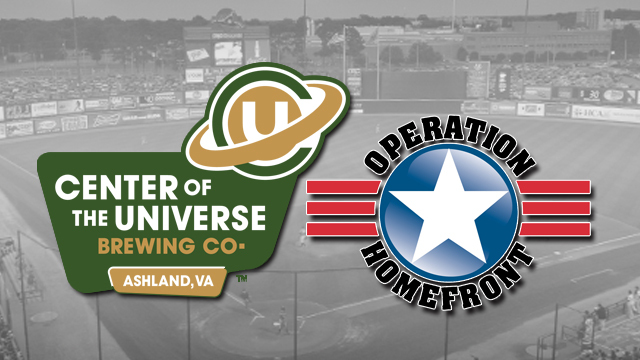 The Richmond Flying Squirrels, Double-A affiliate of the San Francisco Giants are excited to announce that once again Homefront IPA, a specialty beer brewed by Center of the Universe Brewery with all proceeds going directly to Operation Homefront, will be released at The Diamond and available for a limited time on Friday night. Center of the Universe Brewery along with 10 other designated breweries across the country brew this IPA for the Memorial Day weekend to benefit Operation Homefront, a non-profit with a nationwide organization that provides emergency and other financial assistance to the families of service members and wounded warriors. Operation Homefront has provided assistance to thousands of military families since its inception in 2002. The 11 breweries combined donate 100% of proceeds and will raise a minimum of $150,000 for Operation Homefront this year. Prior to their 5:00p.m. 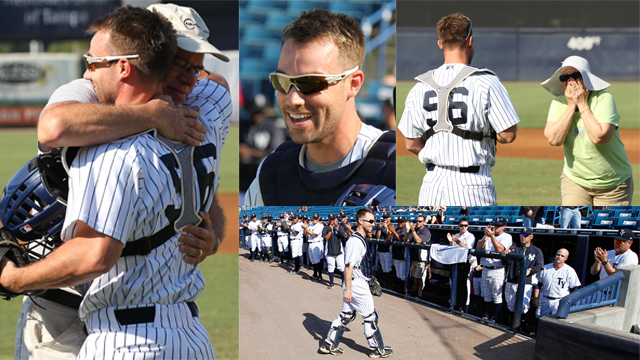 game vs. Jupiter, the Tampa Yankees were honored to welcome home Lieutenant Matthew Pelletier. Joe Pelletier, the father of Lieutenant Pelletier, thought he was visiting Steinbrenner Field and throwing out the game’s first pitch as a potential Tampa Yankees sponsor with his company, AmeriLife. He had no idea he was about to see his son, who was on the receiving end of the pitch and dressed in a full Tampa Yankees uniform, complete with catcher’s gear. Lieutenant Pelletier had not seen his father since August 2013, before deploying for the U.S. Army. The Tampa Yankees are the Single-A Advanced Affiliate of the New York Yankees. For more information about the Tampa Yankees call (813) 673-3055 or visit www.tybaseball.com. This article originally appeared on the official website of the Tampa Yankees. Click here to view the original story. The Northwest Arkansas Naturals are teaming up to help the Salvation Army Northwest Arkansas Area Command as they assist with the recovery efforts after devastating tornadoes hit Central and North Central Arkansas in late April. This Memorial Day weekend, the Naturals will do our Launch-A-Ball Fundraiser – normally done after each Friday home game – following the Post-Game Fireworks Spectacular on both Friday, May 23rd and Sunday, May 25th. Fans can purchase Launch-A-Balls for $1 at each game, and then try and hit targets on the field after the game to win prizes from the Naturals. In addition, 100% of the proceeds will be given to the Salvation Army Northwest Arkansas Area Command to help tornado victims in Arkansas. On Saturday, May 24th, the Naturals will hold a memorabilia auction behind Section 109 on the concourse that will feature signed memorabilia from the Naturals, the Kansas City Royals, and other Minor and Major League organizations. Like with Launch-A-Ball, 100% of the auction proceeds will go to tornado relief efforts and the Salvation Army. Items that will be up for auction on Saturday night include a Vance Wilson Jersey, a Wil Myers Jersey, a Brian Poldberg Kansas City Royals Jersey, a Frank White autographed Wichita Wranglers Jersey, a 2008 Naturals’ team autographed jersey, along with a wide array of autographed baseballs, and other items collected over the past few weeks. The auction will end in the middle of the 6th inning. The Fisher Cats Foundation and Velcro USA Inc. awarded $5,000 to local schools on Saturday night at Northeast Delta Dental Stadium. Nine schools were honored on the field for having one-hundred-percent of their students complete the Fisher Cats Reading Challenge presented by Velcro USA Inc. during the 2013-2014 academic year. Three of those schools took home cash prizes for completing the challenge. The nine schools from across New Hampshire and northern Massachusetts we re recognized as finalists during Saturday’s pre-game ceremony for having every student complete the challenge by reading five books outside their normal school curriculum. Each school was entered into a drawing to win one of three cash prizes, totaling $5,000, from the Fisher Cats Foundation. Webster Elementary earned the top prize of $3,000; St. Joseph Regional Junior High School and Highland-Goffe’s Falls Elementary School were each awarded a $1,000 prize for their all-encompassing efforts during the challenge. On Saturday night, faculty members from Ashby Elementary, Bakersville School, Highland-Goffes Falls School, Maple Avenue School, Salisbury Elementary, St. Benedict Academy, St. Joseph Regional Junior High School, Thomas Ditson Elementary School, and Webster Elementary School were celebrated for their success. Four of the schools – Ashby Elementary, Maple Avenue, Salisbury Elementary, and St. Joseph – have been recognized for their participation efforts in successive years. During the school year, the Fisher Cats and Velcro USA Inc. reached out to approximately 60,000 students in more than 150 schools to present this year’s Reading Challenge. Students needed to complete the challenge in order to earn individual recognition at a Fisher Cats game. Upon completing the challenge, each student received a pair of tickets, courtesy of Velcro USA, to a Fisher Cats Reading Challenge game and the opportunity to participate in a pre-game parade around the field. This article originally appeared on the official website of the New Hampshire Fisher Cats. Click here to view the original story. The Altoona Mirror and AMBUCS Altoona have partnered up with the Altoona Curve to present the Curve, Pa. Heroes Game during the 2014 Eastern League All-Star Stop presented by UPMC Health Plan, the parties announced today. The Curve Pa. 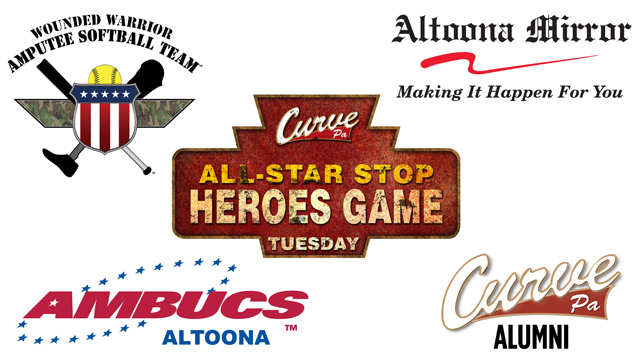 Heroes Game presented by the Altoona Mirror & AMBCUS Altoona will kick off the two days’ worth of festivities surrounding the Eastern League’s midsummer classic in Curve, Pa. The Wounded Warrior Amputee Softball Team (WWAST), which is made up of young, competitive, athletic veterans and active duty soldiers who have lost limbs post-9/11 while serving their country in the military/war, will be taking on a group of Curve, Pa. Alumni in the Heroes softball game. One member of the WWAST that will be participating in the game will be Josh Wege, who was in the U.S. Marines and served in Operation Enduring Freedom. Wege participated in the 2013 MLB Legends Celebrity Softball Game and was named the game’s MVP. Already scheduled to represent the Curve Alumni in the game are Adam Hyzdu, Mike Johnston, Tike Redman, Chris Snusz and Jack Wilson. They’ll be joined by a few additions in former Curve OF Kory DeHaan and LHP Mike Connolly. DeHaan, who is currently the hitting coach with High-A Bradenton, played for the Curve during their inaugural season in 1999, reached the major leagues in 2000 with San Diego and again in 2002. DeHaan batted .268 with 13 doubles in 47 games for the Curve during the 1999 campaign. He last played professionally in 2003 for the Portland Beavers (Padres’ AAA Affiliate), playing in 54 games. Connolly played for the Curve from 2003 to 2006 and reached as high as Triple-A both in 2005 and 2006. He was originally a 19th round draft pick in the 2000 draft out of Oneonta (NY) HS. Connolly currently resides in Altoona and is the co-owner/operator of ERA Sports, a baseball and softball academy offering advanced lessons and fielding teams that travel regionally to participate in tournaments. AMBUCS Altoona , which is a national non-profit service organization consisting of a diverse group of men and women who are dedicated to creating mobility and independence for people with disabilities, has partnered up for the first day of events to help raise support and funds for the purchase of an Action Trackchair for one veteran here in Blair County. AMBUCS is working with the James E. Van Zandt VA Medical Center to select the recipient for the Action Trackchair. The Action Trackchair is the ultimate in off-road wheelchairs and will give its user the ability to navigate mountain roads, campgrounds, woods, beaches, hiking trails, frozen lakes, snowy terrain and much more. All proceeds from the Ghostman Games & Hitting Challenge jerseys that the All-Stars will wear will be donated to the fund to purchase of the Action Trackchair. In addition, fans can purchase their very own Ghostman Games jersey with a portion of the proceeds from the sales going to the purchase of the Trackchair. The Curve will be accepting general donations up until the Eastern League All-Star Stop during game days at the Laurel Eye Clinic Customer Service Booth or non-game days inside the front office at Peoples Natural Gas Field. This article originally appeared on the official website of the Altoona Curve. Click here to view the original story. The Altoona Curve, in conjunction with the Rolling Thunder (American Legion Riders Post 12) based out of Somerville, N.J. will dedicate a seat from the Toyota Diamond Club to those American soldiers who are unaccounted for with a POW/MIA seat following the Curve, Pa. Heroes Game presented by the Altoona Mirror and AMBUCS on July 15, the team announced today. The seat, which will be painted black and affixed with the POW/MIA decals, is located in section 112, row 3, seat 3. There will also be a plaque that goes with the seat, which will be installed and located in an area around section 112. The seat dedication is a part of a series of events surrounding the 2014 E.L. All-Star Stop presented by UPMC Health Plan to honor those that have served our country. A group of Curve, Pa. alumni will be playing the Wounded Warrior Amputee Softball Team (WWAST) in a softball game for the Curve, Pa. Heroes Game to start the events on the 15th. 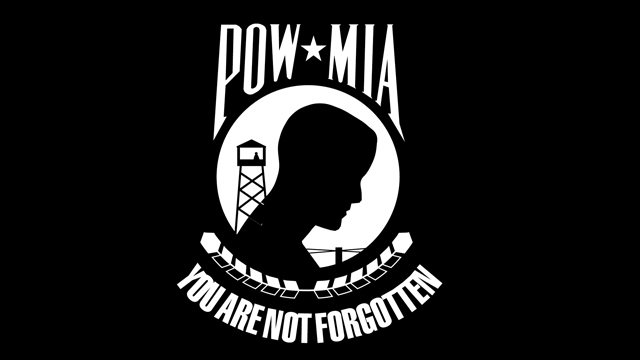 Both the Eastern Division and Western Division All-Stars will don special jerseys for the Ghostman Games & Hitting Challenge that will follow the POW/MIA seat dedication ceremony. All proceeds from an auction of those jerseys will be put toward the purchase of an Action Trackchair for one local veteran that will be selected by AMBUCS in conjunction with the James E. Van Zandt VA Medical Center. 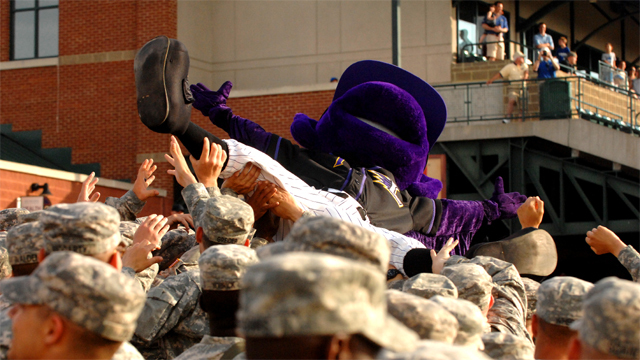 The Louisville Bats begin an eight-game homestand Thursday, May 22 at Louisville Slugger Field that will feature two fireworks shows, a patriotic hat giveaway and Military Appreciation Day. The patriotic cap giveaway on Saturday, May 24 will be the second of the Bats’ four regular-season cap giveaways. The caps will be given to the first 2,000 fans through the gates. The Bats will face the Buffalo Bisons, Triple-A affiliate of the Toronto Blue Jays, for four games from Thursday, May 22 through Sunday, May 25. Military Appreciation Day will be on Monday, May 26. All retired and current military personnel and their families will receive free field reserved tickets with proper military identification. Monday will feature the first of four games against the Scranton/Wilkes-Barre RailRiders, Triple-A affiliate of the New York Yankees. Fireworks during this homestand will be on Friday, May 23 and Memorial Day Eve on Sunday, May 25. The Bats depart for Columbus on Friday, May 30 for the first two games of a split four-game series with the Columbus Clippers, Triple-A affiliate of the Cleveland Indians. The team returns to Louisville for two more games with Columbus on Sunday, June 1 and Monday, June 2. Sunday, June 1 will be 50-Cent Hot Dog Night at Louisville Slugger Field. Louisville finished a 6-2 road trip through Norfolk and Durham on Tuesday and comes home sitting in third place in the IL West at 22-23, just 4.0 games back of first-place Indianapolis. The trip was the team’s first six-win road trip since July 2010. Outfielder Felix Pérez is hitting .296 in May and leads the International League in RBI and extra-base hits in the month, including four home runs on the road trip. The Bats have averaged 8,979 fans per game at Louisville Slugger Field since its opening in 2000 and have totaled over 8.8 million fans through 14 seasons. Tickets for all regular season games are available. The entire 2014 Bats schedule, including updated promotions and special events, can be found at batsbaseball.com. Single-game tickets may be purchased online, by calling 1-855-228-8497 or by visiting the Louisville Slugger Field box office. Full and partial season tickets along with group outings and suite rentals are available by calling the Bats front office at 502-212-2287. This article originally appeared on the official website of the Louisville Bats. Click here to view the original story. The Salt Lake Bees will honor men and women of the United States Armed Forces during Military Appreciation Night on Saturday, May 24 as the Bees take on the Fresno Grizzlies at 6:35 p.m. The evening will feature ticket specials and military-themed entertainment. The Bees are offering all military personnel with proper identification a free reserved ticket to the game. Military personnel can also purchase half-priced tickets for their families. These tickets can be purchased by calling 801-325-BEES (2337) or at the Smith’s Ballpark box office. Colonel Ryan Britton with the US Air Force will throw out the ceremonial first pitch, the 807th Medical Command out of Fort Douglas, Utah will lead the presentation of the colors and the Hill Air Force Base 419th Anthem Choir will perform the national anthem and sing “God Bless America” during the seventh-inning stretch. A special military-themed fireworks show presented by Big O Tires will begin at the conclusion of the game. Bees tickets are available online with no additional feels at slbees.com, by calling 801-325-BEES (2337), at the Smith’s Ballpark box office from 8:30 a.m. – 5:30 p.m. or at all Smith’sTix outlets and Smith’s Food & Drug Stores. 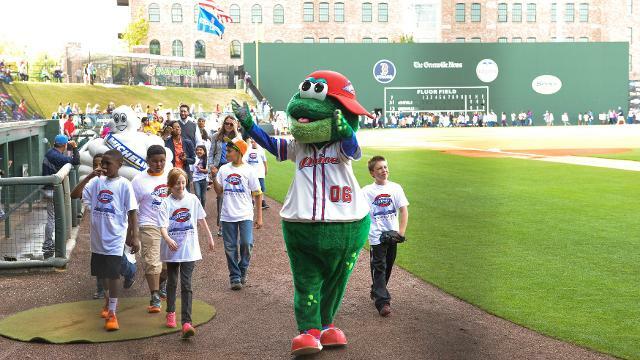 On June 4th, fans can take their annual Playcation with the Greenville Drive and Upstate attractions, as 2014 brings another exciting package! 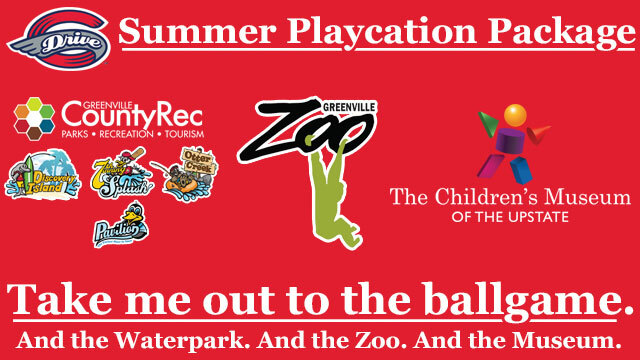 For just $40, fans will receive four tickets to that evening’s Drive game, plus four passes to The Children’s Museum of the Upstate, the Greenville Zoo, and the Greenville County Rec Waterparks/Pavilion, a savings of $100! The passes for the Upstate attractions are good through September 1st. Fans who already have tickets for the game on June 4th cannot add on the Playcation to their existing tickets, they must purchase the package as a whole. Act now, because the Playcation package will sell quickly! It can be purchased by visiting Fluor Field’s Main Street Box Office or by calling (864) 240-4528. At the time of purchase, fans will receive four Drive tickets plus a card that can be redeemed at all of the Upstate attraction locations. The Everett AquaSox announced today that they are partnering with the Providence Comprehensive Breast Center for Pink at the Park at the Everett AquaSox-Spokane Indians game on Friday, June 27. The event will celebrate women’s health, raise awareness and proceeds will benefit the Breast Center. AquaSox players and coaches will be wearing pink jerseys on the 27th, which will be autographed and auctioned off during the game. There will be face painting and hair painting available in the concourse, an information fair on women’s health as well as a raffle for several gift baskets. Proceeds from all of these elements will go to the Providence General Foundation’s Comprehensive Breast Center Fund to help raise awareness for local breast cancer detection and treatment. “Partnering with the AquaSox to help meet the health needs of women in our community with breast cancer is truly a gift. The funds will be used to support our local Breast Center and the patients we serve. We’re grateful for this generous support, said Gayle Jago, Manager of Providence Comprehensive Breast Center. Tickets for this event are on sale now at aquasox.com/groups, with the group password: pink2014. Four dollars from every ticket purchased through this link will go to the Providence Comprehensive Breast Center Fund. To learn more about the Providence Comprehensive Breast Center, please visit phcbc.com. If you’d like to purchase tickets to Pink at the Park on June 27th, visit aquasox.com/groups and use code: pink2014. This article originally appeared on the official website of the Everett AquaSox. Click here to view the original story. In celebration of Memorial Day weekend, the St. Lucie Mets would like to pay tribute to the service men and women of our country by offering all current military personnel and veterans free admission into Friday’s game. The Mets host the Clearwater Threshers at 6:30 p.m. Gates open at 5:30 p.m.
Veterans and active military just need to show proof of ID at the Tradition Field box office to get into the game free of charge. Prior to first pitch there will be a color guard, the performing of the National Anthem and ceremonial first pitches delivered by members of the American Gold Star Mothers. The American Gold Star Mothers are an organization of mothers who have lost a son or daughter in the service of our country. For more information, visit www.stluciemets.com or call 772-871-2115. This article originally appeared on the official website of the St. Lucie Mets. Click here to view the original story. Did you know an estimated 50 million Americans go hungry every day, including one child out of every five in this country? To help raise awareness and inspire action, Fifth Third Bank and the Mud Hens are teaming up to collect food during the May 26-June 2 homestand in support of the Food for Thought program in Northwest Ohio. Fans attending the Mud Hens home games between Monday, May 26 and Monday, June 2 are encouraged to bring non-perishable food items to the ballpark. Boxes will be readily available at all entrances. Fifth Third chose the food drive as this year’s bank-wide service project in honor of Fifth Third Day which occurs annually on May 3. 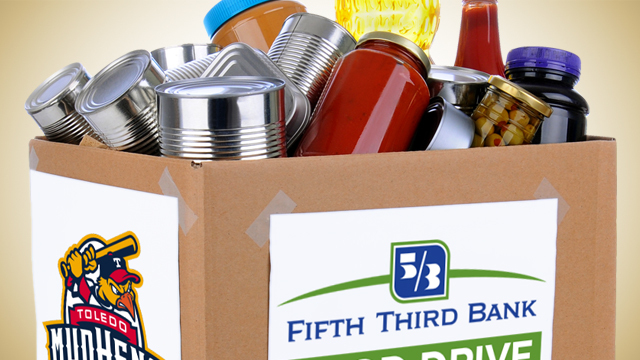 Fifth Third Bank will celebrate Fifth Third Day at the Ballpark on Saturday, May 31 during the Food Drive. During the past two years, Fifth Third employees provided more than 890,000 meals to those in need. For 2014, each of the Bank’s affiliates has created its own plan to fight hunger, with the goal of providing at least 530,000 meals. Food for Thought is a social justice non-profit dedicated to feeding the hungry and offering dignity, welcome and relationship to anyone in need. The group operates a stationary food pantry in Oregon and a mobile pantry which visits 17 fixed locations around the Toledo area every month. Call 419-725-4367 for tickets to the May 26 through June 2 games or order online. 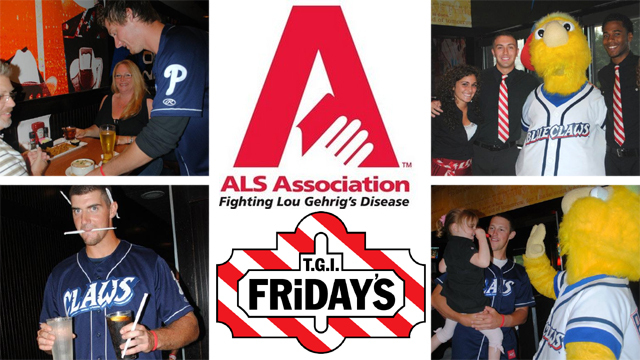 The BlueClaws are proud to hold their 14th annual ALS Celebrity Waiter Event on Wednesday, June 4th at TGI Friday’s on Route 70 in Brick. The event, which started in 2001, raises money for the ALS Association of Greater Philadelphia, the principal charity of the Philadelphia Phillies. This marks the third straight year the event will be at TGI Friday’s in Brick. There will be two seatings: one at 5:30 and another at 7:00. As in years past, BlueClaws players will be serving as the waiters, and coaches will serve as bartenders. 20% of every check, plus 100% of all tips, will be donated directly to the ALS Association of Greater Philadelphia. Reservations are encouraged and can be made by calling 732-262-0937. “This has been a wonderful partnership between the BlueClaws and the ALS Association over the last 13 years and we are looking forward to what is always a great event,” said Jim DeAngelis, BlueClaws Director of Community Relations. “The Phillies and their family have raised money to fight ALS for 30 years and here at the minor league level, the BlueClaws have been able to do the same since our inception in 2001,” he added. The ALS Celebrity Waiter event has raised nearly $125,000 in its first 13 years. There will also be a silent auction, while BlueClaws players will sign autographs and pose for pictures throughout the night. The BlueClaws are the Jersey Shore’s top stop for affordable, family entertainment. They have led the South Atlantic League in attendance in all 13 years of existence. Tickets for all remaining BlueClaws games are on sale by calling 732-901-7000 option 2 or online at BlueClaws.com. Christie Fleming (far right) from Chicken of the Sea presents the check for $10,000 to representatives from the Kiwanis Miracle League. 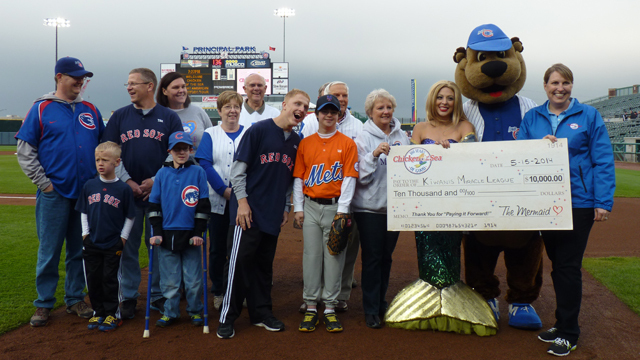 In a special ceremony prior to tonight’s Iowa Cubs game at Principal Park, representatives from Chicken of the Sea made a $10,000 donation to the Downtown Kiwanis Miracle League. The donation will allow 50 kids to play the entire season with the Miracle League this summer in downtown Des Moines. The donation was part of the Chicken of the Sea’s “Great American Gratitu de Tour.” In celebration of their 100th anniversary, Chicken of the Sea is touring the country to give back to local organizations and individuals who are doing great work in their communities. Chicken of the Sea will donate $1,000,000 by the end of their tour. Chicken of the Sea Vice President of Marketing Christie Fleming addressed the crowd and made the official presentation to several of the board members, parents, and players from the Miracle League on hand at Principal Park tonight. Fleming is a native of Oskaloosa, Iowa and a graduate of the University of Northern Iowa. She was joined on the field by Catalina, the mermaid mascot for Chicken of the Sea. To find out more about the “Great American Gratitude Tour” and the organizations that have benefitted from these donations, visit chickenofthesea.com/100. For fans that received a gold coin at the game tonight, that’s also the place to enter your code to see if your coin is worth $10,000 or another prize from Chicken of the Sea. This article originally appeared on the official website of the Iowa Cubs. Click here to view the original story. The Greenville Drive and Michelin, N.A. are excited to celebrate the 2014 Reading All-Stars from Greenville County middle schools and all Anderson and Spartanburg County schools on Sunday, May 25th! The Drive’s seventh annual reading incentive program is designed to encourage learning and education success through reading, and the program reaches over 75,000 students year-round. First pitch for the game with the Augusta GreenJackets is at 4:05, but the fun starts at 3:30, as the Drive honor these Reading All-Stars for their hard work this school year with participation in a pre-game “Parade of Champions” around Fluor Field. Each Reading All-Star will also be presented with a Drive – Michelin Reading All-Star commemorative t-shirt. During the game, five schools with continued success in the program will be inducted into the inaugural Reading All-Star Hall of Fame, and top performers for the school year will be recognized. In addition, students will participate in the in-game entertainment, including a tug-of-war, shoe scramble, sack race and more! To purchase tickets for Sunday’s game, stop by the Main Street Box Office, call (864) 240-4528 or log on to GreenvilleDrive.com.